Wednesday July 22 1908 I got my work done early. Mother & Cora came at 9.39 and Rob was out for dinner. We visited all afternoon. I sewed a little. They did not go home till the 7.12 car I went down to the depot with them. Did evening work. I feel much better today. Weather warm. Thursday July 23 1908 I am 57 years old today. I got my morning work done so I went down town an hour early for things needed. I got the dinner over and went down to Woolfs from 3.12 to 5.39. Poor Will is very poorly. I did the evening work. The boys busy with the hay. 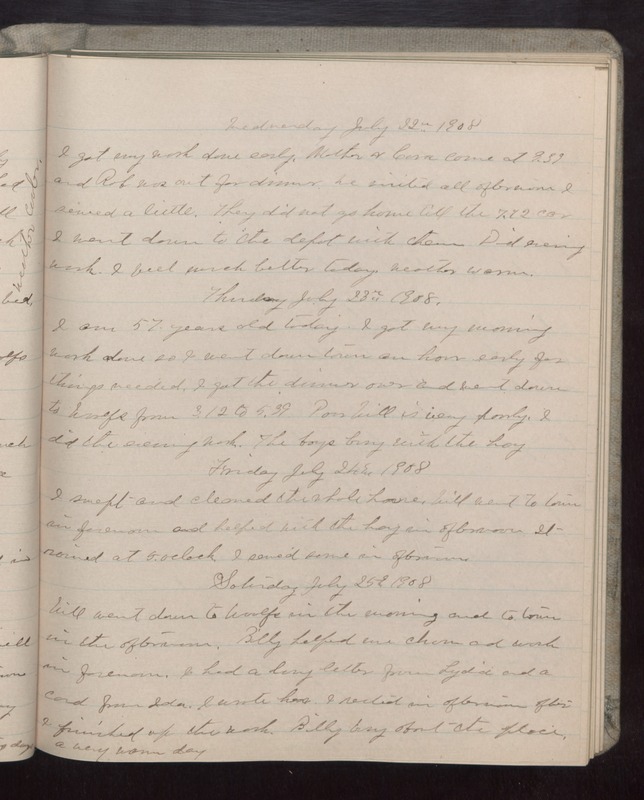 Friday July 24 1908 I swept and cleaned the whole house. Will went to town in forenoon and helped with the hay in afternoon. It rained at 5 oclock. I sewed some in afternoon. Saturday July 25 1908 Will went down to Woolfs in the morning and to town in the afternoon. Billy helped me churn and work in forenoon. I had a long letter from Lydia and a card from Ida. I wrote her. I rested in afternoon after I finished the work. Billy busy about the place. A very warm day.